Around 5:00 on New Year’s Day, I got the call. “You gotta come pick up this kid,” Savannah’s father blurted before I even had time to say hello. Kid. It was that bad. He wasn’t even referring to Savannah by name. By the time I arrived at his East Village apartment, she was calm, but a he said, she said debate was brewing about what triggered the meltdown. I suspected she was cranky from staying up till 3:00 a.m. the night before and domestic issues in his home, but at the point my only concern was how to prevent future outbursts. 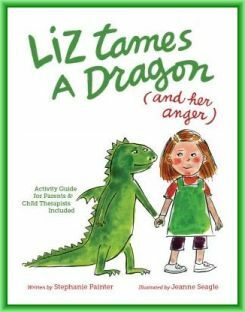 Once home, I pulled out Liz Tames a Dragon…and Her Anger, a book I had tucked on the shelf months ago and been meaning to read. Written by Stephanie Painter and illustrated by Jeanne Seagle, it was a way I could teach Savannah that anger, while a normal emotion, needs to be controlled. In the story, Liz, exasperated with her baby sister’s antics, becomes so angry that she morphs into a fire-breathing dragon. Liz is certain that her sister has cast a magic spell until she realizes only she has the power to tame the dragon. In the back of the book is a wonderful Activity Guide for Parents and Child Therapists by Marlo Carney Zarzaur, Ed.D. to help reinforce the lesson in the story. Reading and working through the book with Savannah, I found I could address her outburst, and even help her develop strategies for next time she felt out of control, without being shamming or sounding punitive. Not only did we both survive the meltdown, but Savannah liked Liz Tames a Dragon…and Her Anger so much that she took it to school to share with class on reading day.